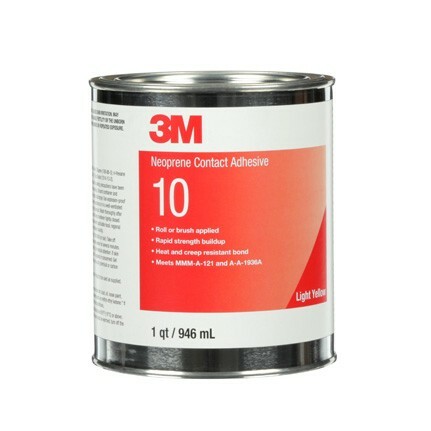 3M Neoprene Contact Adhesive 10 Light Yellow, formerly known as Scotch-Grip, is a fast drying, multi-purpose, polychloroprene adhesive that is used for bonding wood, rubber, plastic laminate, canvas, aluminum, masonry, steel, and wallboard. It is resistant to plastic flow and can be applied by brushing and rolling methods. 1 qt Can. 70 to 676 depending on temperature. Bond plastic laminate, aluminum, steel, wallboard, wood, masonry, rubber and canvas.